Fun and entertainment have become one of the most sought-after qualities in today’s world. Be it television, radio or apps for the matter, we want something which is funny, entertaining and encaptivating like cartoon photo editor app for android. Over the entire course of a hectic day, one often turns to a mode of entertainment to relieve stress. Irrespective of the day, everybody wants one or other medium to instill fun and enjoyment into their lives. But it is easier said than done. So we bring to you some of the best ways to have fun using your Android device. Burst into laughter, doing some of the coolest and entertaining things with the below list of apps on your device. Draw cartoons of yourselves, your friends or off places you are traveling or visiting. some the amazing moments by turning them into cartoons to enjoy and laugh at it with your friends and family. Below I have listed 10 best cartoon photo editor apps for android to turn your photo to cartoon. 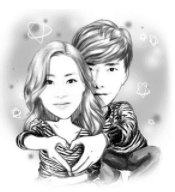 One of the most popular cartoon apps on the Android platform, Cute Face Image Maker is the best. The app has enjoyed a great response until now and is continuously gaining popularity. It is being loved as one hell of an app by every Android camera enthusiast. The app is a must-have on your device. The technology used to develop Cute Face Image Maker allows users to turn their photos into funny cartoons. Thus, you can give a cute and funny touch to your already captured pictures. Moreover, you can also change your photos to sketches, pencil drawings, and oil paintings. The app comes loaded with features such as easy to use, pinch to zoom in and out, manage flashlight and others. It also offers an extensive set of photo-editing tools as well. As the name suggests, an app is more than able to turn your best photographs into cartoons. Amazingly, Cartoon Photo Editor is hugely popular and loved among the Android audience for its crafty features and nifty ease. The app offers to turn pictures into cartoons by doing some artwork. Moreover, the pictures surely seem funny and entertaining. Furthermore, the app also supports a plethora of filters to choose from. The filters can be used extensively to edit your pictures and extract a cartoon image from it. The app allows not only importing photos from gallery and editing them into hilarious cartoon pics, but it also supports taking pictures directly using cartoon and other filters offered by the app. The app also comes loaded with a precise set of photo editing tools to enhance the quality of the picture. So, you can turn into superheroes and cartoons instantly without any hitch. Cartoon apps are only good if they are fun and entertaining. One such amazing cartoon app which catering to your cartoonist fandom is Cartoon Image Creator. Turning your photos into funniest cartoon pictures is just one click away. The app is hailed as the most lovable cartoon making an app because of some of the fantastic features it offers. 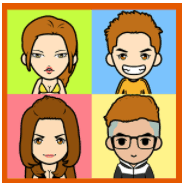 The app uses an array of custom cartoon images for you and your friends. Use these cartoon images as per as your interest and needs and give your photos a complete cartoon makeover. Not only that, but the app also allows you to create cool and funny cartoon avatars of yourself. Moreover, the app catalog consists of over 300+ variety of clothes, accessories, background, and colors to change your picture into a cartoon. The app even features some top-notch hairstyles which can be put to good use for entertainment. Cartoon Photo Maker is another cartoon app popular across the Android ecosystem. The app is proclaimed by various users of being effectively changing your pictures to a cartoon. Hailed as the best cartoon photo editor app, Cartoon Photo Maker enjoys a decent fan following. The app allows you to turn your photos into artistic cartoons thanks to a ton of photo-editing tools, fantastic filters, and elegant effects. The app offers effects such as cartoon, pencil sketch, drawing and comic strip depending on the needs of the user. Using the amazing array of effects and filters one can turn the entire picture into cute or a funny cartoon. The app supports taking pictures of real-time effects from both front and back camera. All you need is a snapshot and you can turn the picture into a canvas using the artistic tools at your disposal. Apart from many impressive effects, Cartoon Photo Maker supports sharing photos with your friends and family. Another name which can be added to this list is Cartoon Photo Filter Effect. The functionality offered by the app is completely justified by the name of the app itself. Cartoon Photo Filter Effect is an amazing cartoon photo editor app for android for creating photos with cartoon effects. With more than 50+ effects available, the app is nothing short of powerful and extensive for creating cartoon filtered images of your pictures. The vast list of effects available can be used as one sees fit to create some of the best quality cartoon pictures which seem not only cute and adorable but are also funny and entertaining. Moreover, the app offers enriching customization options for customizing the pre-determined filters as one may see fit. The app also includes some basic quintessential photo-editing functions such as crop, rotate and resize. The photos generated by this app can be stored directly on your device and can be easily shared with your friends and family across all the social media and utility platforms. 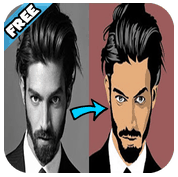 For all those looking to seek advantage of the free app, Cartoon Photo Editor app is a completely free cartoon android app. The app packs more power and functions than any other paid cartoon app and is more focused on functionality than dollars. As the name suggests, Cartoon Photo Editor is a photo-editing app. However, the app is one of its kind with photo-editing combined with cartoon filters and effect. Meaning, now you can edit your photo and turn them into funny cartoon absolutely free. The Android app boasts of some of the most effective cartoon features such as amazing effects, photo-editing tools, and funky filters. 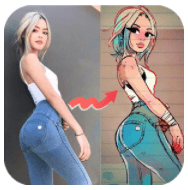 With this app, you can not only turn your beautiful pictures into amazing cartoons but you can also convert the photos to sketches and portraits. Moreover, drawing pictures and cartoons is also possible with this feature rich android app. The range of filters vary from pencil art to oil paper and are some of the amazing set of functions available on a cartoon app. The special Android app to spread fun and joy has arrived. Welcome, Cartoon Photo HD, a powerful and amazing cartoon app on the Android ecosystem. Using Cartoon Photo HD a user can create some of the most incredible cartoon effects on their pictures. Now Android users can easily transfer a photo from their gallery to a cute and funny cartoon picture, thanks to Cartoon Photo HD. Moreover, the app readily converts the pictures captured using the inbuilt camera in real-time to funny cartoon photos owing to a powerful and vibrant catalog of cartoon effects and filters. The app offers some of the best filters and effects of a photo-editing app such as HDR, Lomo, and Gotham. The app also supports easy conversion of images to sketches and embossed comic. Turning your pictures into cartoons seems like a really cute idea. Moments Cartoon perfectly understands the emotion and is an amazing Android app to convert your captured moments into super-awesome cartoons. 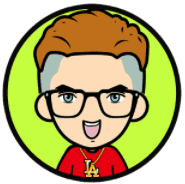 The app provides a unique feature where you can easily get a cool cartoon avatar of your face and share the same with your friends and family. More importantly the packs some powerful and popular features such as moment’s selfie cartoon effects, face swap and caricature masks to scare the hell out of people. Besides an array of filters to choose from, Moments Cartoon app also offers some top-notch photo-editing tools to edit your photos. One of the coolest cartoon camera apps available on Android market, Cartoons Camera is used as a cartoon maker app by various Android users. The app is well-known for providing real-time cartoon effects when capturing a selfie. This helps you to click cartoon images on the go and share it immediately without any delay with your friends. Another interesting thing to note about is Cartoons Camera is that the app comprises of some powerful modes which are exclusive and free. 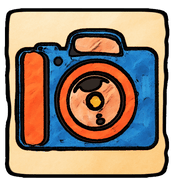 Cartoon color drawing, white strokes, sepia pictures, colored paintings, and edges are some of the powerful featurettes of the Cartoons Camera app. While there are various apps available to change your pictures into a cartoon, Cartoon Photo Editor App is unlike those others. The app is developed keeping in mind, the differences in gender and age. Thus, the app offers an enriching variety of cartoon effects for a male and a female. The different variety of characters available can be posed by both men and women to give their photos a comic and funny touch. With more than 50 frames and a plethora of filters, Cartoon Photo Editor App is nearly the best free cartoon app for turning your pictures into cartoons. The app supports an easy selection of photos from gallery or real-time effect rendering when you capture images. The app also comes packed with a basic set of photo-editing tools to make converting your photos to cartoon easy and simple. The aforementioned list of cartoon apps has a lot more to offer than you can think of. All you need to do is download some of them and create some cool and funny cartoon pictures of yourself and have a dose of laughter as you share them with your friends and family.